It’s just after 10:00, and I’m finally sitting down for the first time since Robbie and I got home six hours ago. I really just want to go to bed, but there’s no way I could let Aunt Hee-ah-ee face another day without a blog. You know you’ve all been there. There are things you need to get done. You need your husband to help. He can’t manage to follow directions. Be honest; I know this doesn’t just happen at my house. I’ve decided that I don’t want my future daughter-in-law to face these concerns. That’s why I’ve started giving Robbie the opportunity to help me clean the house. It started with small directions: I put the laundry next to the stairs and showed Robbie how to throw the clothes over the railing to the stairs below. I asked him to take one toy and “clean up”. We’ve moved on from that a little, especially now that Robbie knows “help” and “helper”. Today, I was able to show Robbie the dirty clothes in his hamper and ask him to throw them downstairs. And. He. Did. He picked up trash and threw it away, reminding me that it was “yucky”. He’s not scrubbing sinks or scouring counters; after all, he can’t reach them. Yet. If I can keep building on this interest in being my big “help, mama, help”, I may actually be able to come home and put my feet up some time before 10:00. And I may not have to still go downstairs to get my sheets. Because they’ll already be on my bed. With hospital corners. My son does not listen. Well, he listens when it’s something he wants. That was not this morning. Justin and I were exhausted, but Robbie was ready to play. Big time. We put him in bed between us and dozed back asleep while Robbie watched Sprout (my new favorite channel, by the way). All of a sudden, Robbie dove over me and off the bed. I’m not sure he had any idea what happened. It seems like the plan was to dive on me, straddle my side, and bounce up and down to wake me up. This is not what he did. The shock kept the tears at bay for about three seconds. I bolted up, grabbed Robbie, and tried to soothe him while explaining to him why that was not OK.
We had a conversation about why you might not want to jump on people who don’t know you’re coming their way. 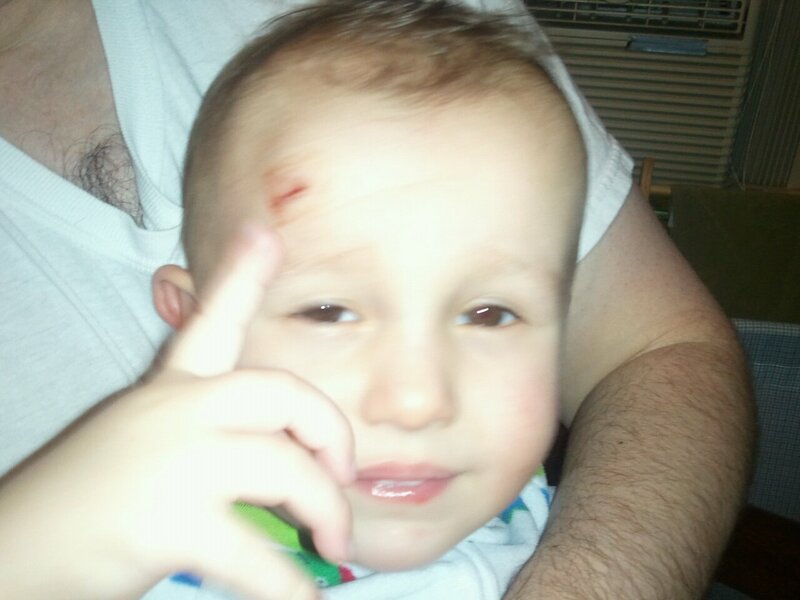 We talked about the importance of not having stitches in two places at the same time. I really thought I got through to him. And maybe I did. But only for about twenty minutes. Yes. He did it again. I had just dozed off again when I felt a body hit me and bounce off. We had the same conversation on the way to Robbie’s room for a time-out. I’m not sure it stuck that time, either. But I felt a little more in control. We started the indoctrination early with Robbie. The day we brought him home, he walked into a foyer lined with Kentucky posters. His drawers were filled with Kentucky onesies and t-shirts. Robbie wears UK “squeakers” (sneakers that actually squeak). He sports the clothes proudly, even wearing a Kentucky football uniform and pretending to be Randall Cobb during football season. But, that was nothing compared to when he started to learn words. Early today, I practiced “Go Cats!” with Robbie. It started at the breakfast table. We tried one of my favorites, but Robbie didn’t quite get the spelling. It came out more, “C…C…T…S… Cats! Cats!” He could never get the “A” or the third “Cats!” But we practiced all day. Robbie left voicemail messages for everyone in our family saying, “Go Cats!” earlier this afternoon. I wasn’t quite sure it stuck until the very end of the game. Justin was, in a shocking turn of events, pacing around the living room. Robbie ran up to the TV and started pacing in front of it, yelling, “Go Cats! Cats! Cats! Go!” One of the proudest moments of my life! While we were at the mall this afternoon, finding out that my computer is so outdated it’s “practically obsolete” (to quote the Apple Genius), Justin picked up a Diet Coke. Robbie, now old enough to decide what he wants, waited patiently for Justin to offer him a drink. When Justin didn’t, Robbie pointed at the cup and said, “Want. Want.” Justin dutifully handed over the cup. And never got it back. Robbie held on to the cup all the way to the car and then all the way to dinner. At one point, I looked back to find that Robbie had finished the drink, taken the lid off, and fished out a piece of ice. He put it in his mouth, sucked on it for a minute, took it out, and proclaimed it, “Nummy!” Then he offered it to me… I’ll have to admit, it wasn’t half bad. Roberto has developed some funny habits. Occasionally bathing with a Mylar balloon. Wearing hats, although rarely getting them on correctly. 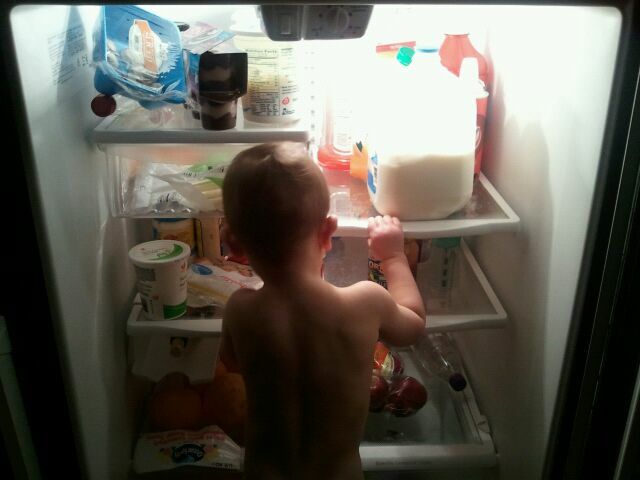 Standing naked in front of the refrigerator. Letting all the water out of the tub and playing in the leftover bubbles. Biting the tips off markers. Tonight, we may have started a new one. 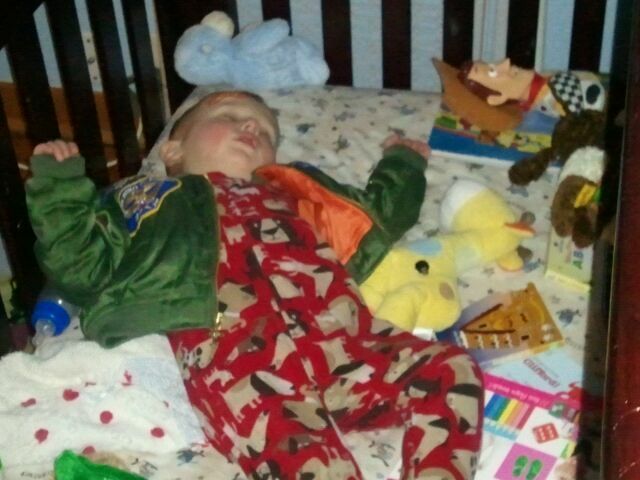 Just before bedtime, decked out in his pajamas and a baseball hat, Robbie found his flight jacket thrown over the railing in the hallway (a habit he learned from his father…), He tried to figure out how to put it on while still holding on to his bottle. When that didn’t work, he brought it to me. Robbie handed me the jacket, turned around, and put his arm out for me to slide the jacket on. The email was short: Rob is hurt. I got it over an hour after it was sent and immediately grabbed my phone. Eleven missed calls. Four voicemail messages. My stomach dropped to the floor. I asked my first period class to please be quiet; there was an emergency with my son. I didn’t have to ask twice; you could have heard a pin drop. The messages were basically all the same. Rob cut his head. 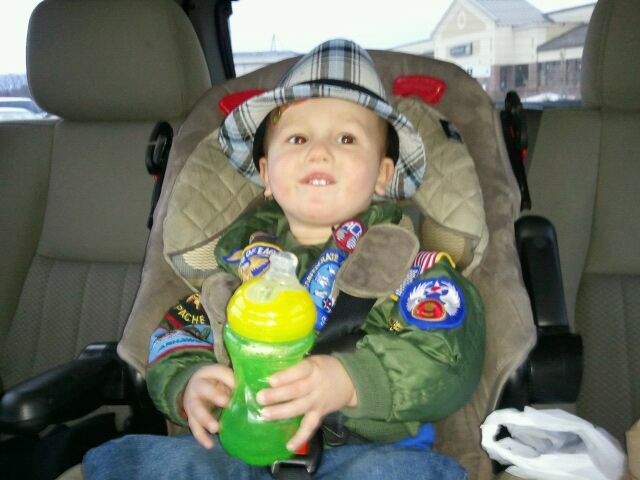 Justin was on his way to daycare. They were on their way to Winchester Hospital. They were at Winchester Hospital. Justin’s phone was dying. He hoped I’d get the message at some point. No one was in the office across the hall, so I called downstairs. There was a sub in my room in minutes, while I tried to impart some last-minute wisdom for my sophomores who are taking the MCAS tomorrow. Then it was a full sprint to the parking lot, pausing to assure friends that I was indeed OK to drive. Honestly – I shouldn’t have been anywhere behind the wheel. Lights just wouldn’t turn green. Cars seemed to slow down all around me. Rush hour traffic still wasn’t completely gone. The twenty-mile trip to the hospital took an eternity. I pulled around to the valet parking at the Emergency Room, threw my car into park, tossed my keys at the startled valet (who was trying to help an elderly woman in a wheelchair – but I had an emergency, right? ), and dashed into the ER. The women saw me rush through the door and knew I was there for Rob. A calm nurse took me back, telling me that everything was fine and Robbie was being a champ. I heard him from down the hall. I’d recognize that laugh anywhere… Yes. Laugh. I walked into the room, and Robbie bolted for me. He had a cotton ball taped to his forehead and a big smile on his face. It turns out the cotton ball was just numbing medication; the tough part hadn’t happened yet. But, while he waited for the inevitable, Robbie was happy to color and run around. While we waited for the stitches, Justin filled me in on what had happened. He’d been about seven miles down 128 when he got a call from Zhining. Her dialogue went something like this: “Is this Robert’s father? Robert’s head is broken. There is blood. He needs to go to the hospital. Please come.” Let me pause here. I’m sure there’s a better translation than “head is broken”. There has to be. 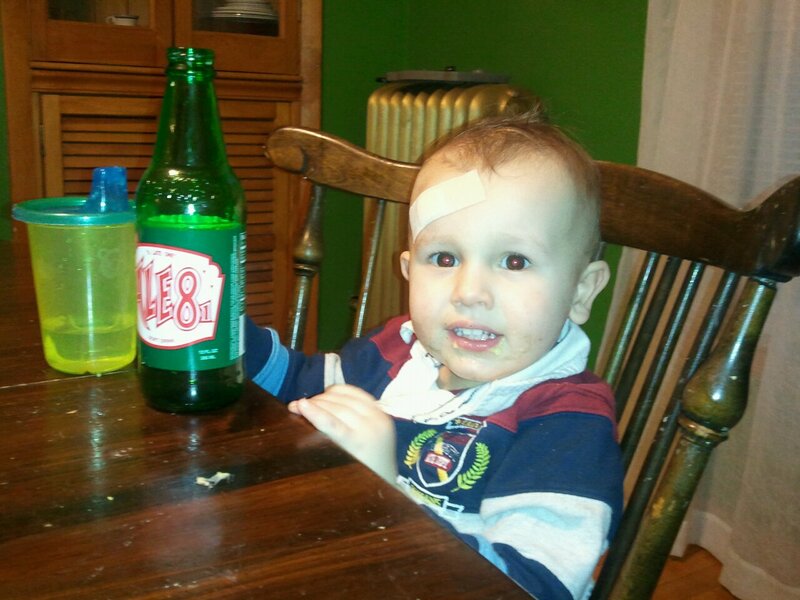 Justin’s imagination immediately went wild as he rushed back to Lexington to discover exactly how Robbie had “broken” his head. 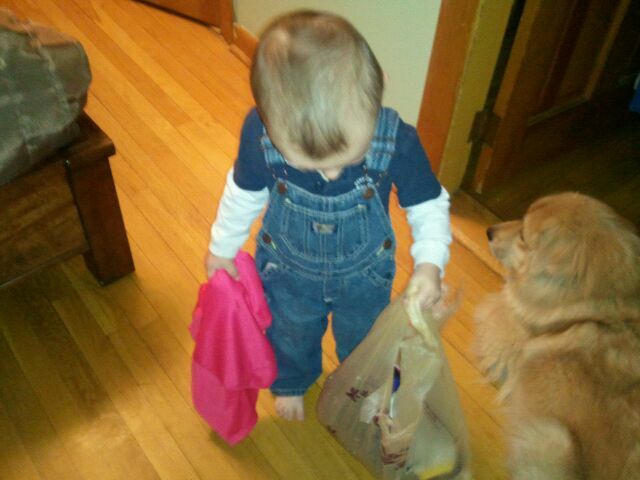 After Justin left, Robbie grabbed a metal Matchbox car, his favorite toy. He ran around daycare like a madman and tripped. As he went down, he landed on the car. And the car kept going. All the way into his forehead. I was a little horrified when the P.A. came to take off Robbie’s bandage and get him ready to suture. 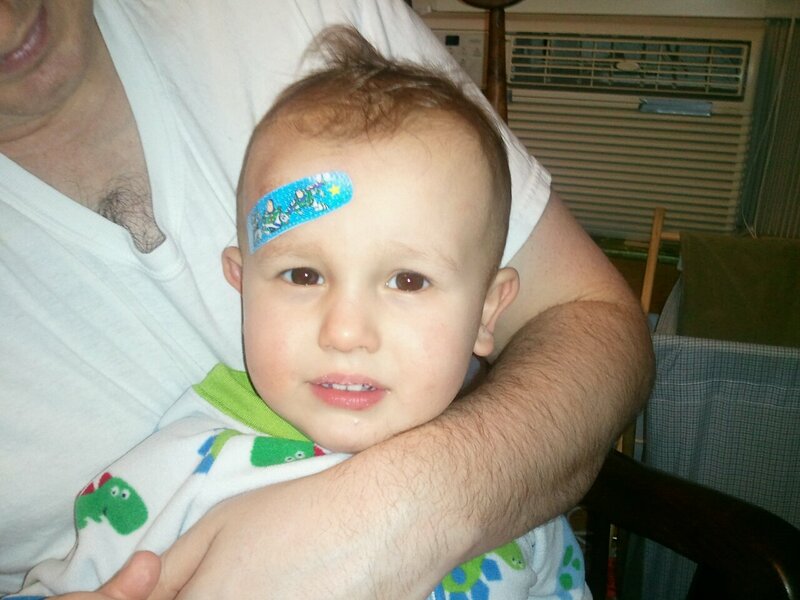 The gash was wider than I expected; there was a hole in my little boy’s head! The whole process is still a little baffling; thank goodness there were some fabulous women to explain it to us. They slip Robbie’s arm into a pillow case, telling him that he got to look like a super hero. Robbie didn’t buy it. At all. Especially when they swaddled him in a blanket. Justin and I held his legs and torso; the nurse held his little head. The screaming started as soon as they began irrigating the wound – twice. Then P.A. covered his face with a napkin (I’m sure there’s a technical term, but…) and got to work. It took two layers of stitches and about ten minutes. I could have sworn it was at least an hour. Robbie’s screams got louder and his “Mama! Mama! Daddy!” got more and more pitiful. Eventually, he started yelling, “Hot! Hot!” Justin and I just looked at each other and held hands while we kept his legs from moving. It was all I could do to keep the tears from taking over. As soon as he was all stitched up and unswaddled, Robbie leapt into my arms. He cuddled with me for a moment and was then distracted by the red popsicle the nurse brought for him. Being the good mom I am, I brought out the camera. Robbie’s face lit up, and he started saying, “Cheese! Cheese!”, posing for pictures as Justin clicked away. He could have cared less about what had happened three minutes before. The rest of the day was much less eventful. Robbie picked out what he wanted for lunch and took a long nap. We attempted to assuage any fears Zhining had when she called in tears to check on QiQi. After his nap, I took Robbie by to see Zhining. I wanted her to know that he really was OK and that no one blamed her. She burst into tears as soon as she opened the door and grabbed Robbie to give him a good once-over. There’s nothing that can prepare you for what happens the instant you find out something has happened to your child. Nothing. I’ve seen him bump his head and fall off a chair. I’ve seen him slam his fingers in a drawer. But not this. Not broken. Not beyond my help. But, you know what? We made it. Justin and I survived it. Together. And with some great stories. 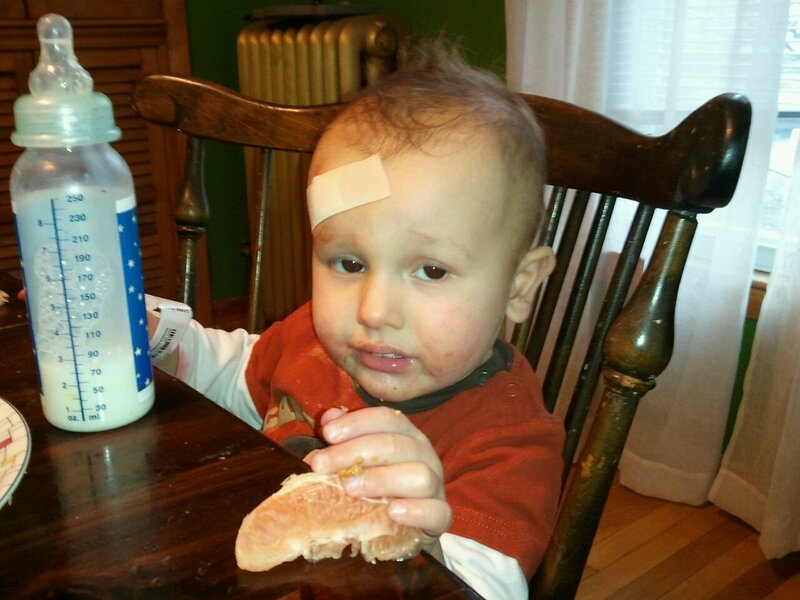 Let’s be honest; most kids crack their heads open on a coffee table. Not mine. My kid impaled himself on a Matchbox car. My story involves a little translation mishap. It’s not the ideal start to a week, but I think I’ll take it. After all, it has a happy ending. And some cool Band-Aids. There’s something about March that makes the weeks drag by. Maybe it’s the gray skies. The fact that there isn’t a single day off. The lingering threat of snow. And this week was really no exception. That’s why today was so important. No work for Justin or me, but daycare for Robbie. We made plans to take a stained glass class in Portsmouth and had a hard time getting a babysitter. After all, who actually wants to be watching a toddler at 8:30 in the morning? I barely do, and he’s my kid. I asked Zhining if her daughter might want to babysit, and Zhining told me to just bring Robbie to her house for the day. Are you kidding me? Do I have the most amazing daycare provider or what? Justin and I bought a Groupon for a stained glass class in Portsmouth, NH, and weren’t quite sure what to expect. We were tired of going to movies or out to eat. We needed to do something together, and I love him for doing something that I would like, for stepping out of his comfort zone. After nearly running out of gas in Georgetown, MA, we got to the class a few minutes late. There were three other women in the class; my poor husband. We scored class. We broke glass in straight lines and curves. 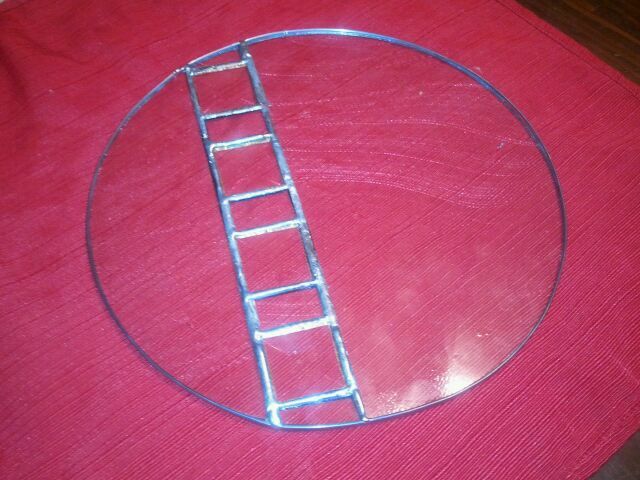 And then we got our projects: clear glass circles. It wasn’t quite what I pictured. I thought lots of colors. There weren’t a lot of options for how to cut and design it, but I’m pretty happy with how our projects turned out. We got to use glass grinders and metal pushpins to hold the project together. I’ll be honest; I didn’t understand why we needed special pushpins. Until we brought out the soldering iron. Then it all made sense.